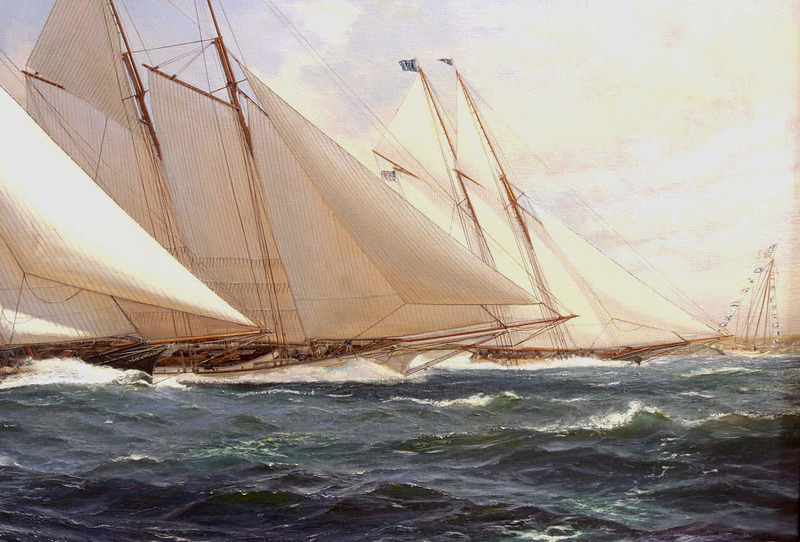 In an event that rightly may be called the most thrilling schooner yacht race on record, mere months after the First Defense of the Americas Cup, the American Schooner MAGIC beat CAMBRIA by a mere 26 seconds. Starting off Fort Adams in Newport, Rhode Island, the course laid south to a marking buoy off Block Island and back, over a course of almost 40 miles. 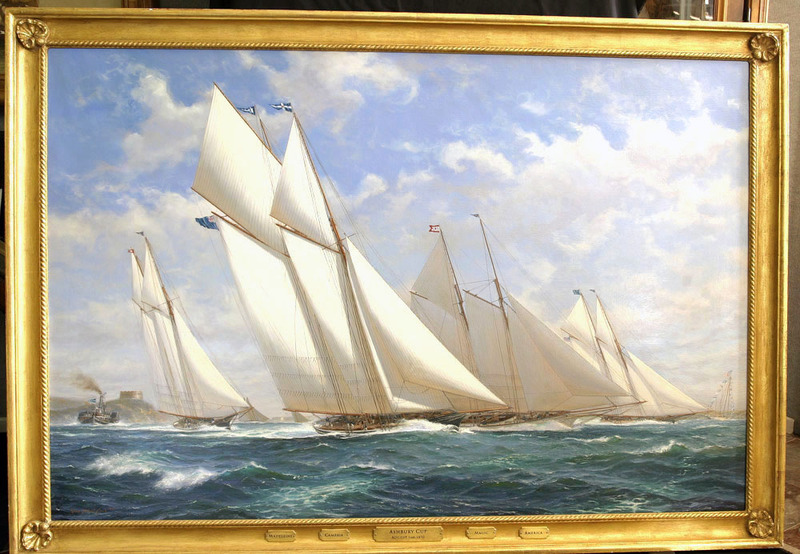 Also sailing in the race were the yachts PHANTOM, TITLE WAVE, MADELINE, IDLER, HALYCON and AMERICA. They race for the inaugural cup that CAMBRIAs owner James Ashbury put up as a prize in his first voyage across the Atlantic Ocean. The painting is a masterwork by Couch, with superb, light, shadow and drama. The depiction of the sea is a superior presentation, rivaling all others. With inspection, the layers of exacting work are revealed, but blend to a naturally beautiful composition. 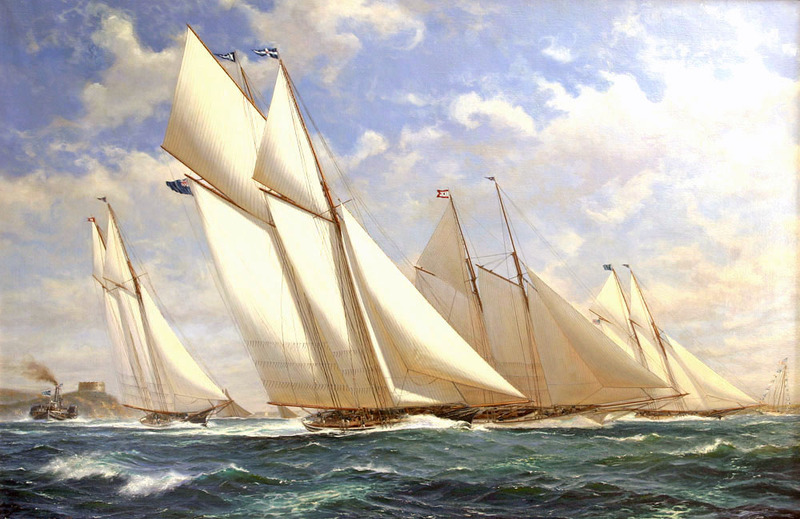 The sky work is a homage to the best of Montague Dawson, and the yachts with their deck in view and bows breaking swells is reminiscent of the quality of James E. Buttersworth. 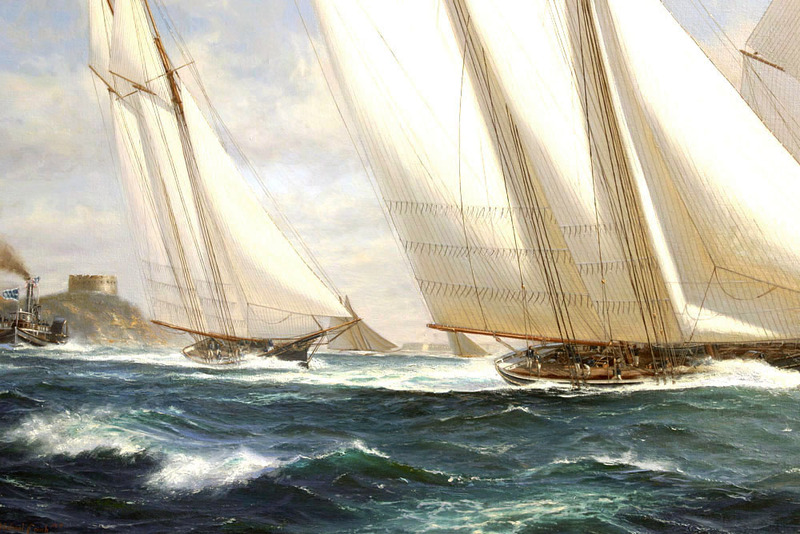 CAMBRIA was built by Michael Ratsey of Cowes in 1868 for Ashbury. She proved quick and fast, winning several races in home waters and the Second Transatlantic against James Gordon Bennett, Jr.s DAUNTLESS. Still, here and in the 1870 Americas Cup Race, she was defeated by New York Yacht Clubs Schooner MAGIC, which was built as the sloop MADGIE in 1857 and converted in 1859 well after AMERICAs success overseas in 1851.